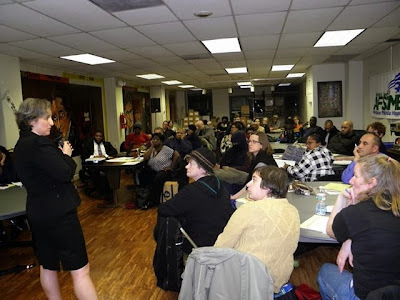 When NOW/ CLUW decided to hold workshops to run for Committeeperson, our goal was to get people to run in those divisions where there was no engaged committeeperson. Some divisions have committeepeople going door-to-door, making sure the voters in their divisions know that an election is coming up and have the information they needed to cast an informed vote. But unfortunately many divisions in neighborhoods around the city do not have committeepeople who provide this essential service. As City Commissioner Stephanie Singer noted in her presentation at our Jan. 18 workshop on running for committeeperson, if there is an incumbent who is doing a good job—someone who regularly visits the households in the division to inform neighbors about upcoming elections—then you might not want to run against this incumbent. You might want to meet with him/her to join forces. Some wards make room for people who want to help with the work of the ward by appointing associate committeepersons; if there are already two committed incumbents, you might want to try to become an associate committeeperson rather than run against the incumbents. Several people have asked me how to find out if there is an incumbent in their divisions, so I have put together some resources which will help potential candidates to find out. First you need to know your ward and division. It is listed on your voter registration card. If you cannot find your card, go here and type in your address. This will give you your ward and division as well as the location of your polling place. You can find out if someone was elected during the 2010 primary by checking the list of committeepersons (organized by ward and division) posted here This list includes all committeepeople who were elected for each Party in 2010-- the last time there were elections for committeepersons. Each division is allotted two committeepersons for the Democratic Party and two for the Republican Party. To find out how much support an incumbent had in your division, go here to learn the vote totals for committeepeople elected in 2010. Select “results tables.” Under “select an election,” select 2010 primary. Then select your ward and division. Scroll down to the bottom for committeeperson results. This will allow you to get a sense of how much support a committeeperson elected in 2010 had in the division. The vote totals also indicate how many people generally vote in your division. In many divisions the turn-out is depressingly low. These are the divisions most in need of an engaged, committed committeeperson. But even in the “high turnout" divisions, turnout is often lower than 50% in non-presidential elections and sometimes under 25% in off-year municipal election. Committeepeople are in an excellent position to significantly increase voter turn-out. Please share this information with anyone you think might be interested and encourage them to attend our follow-up workshop on Feb. 18!